Winter just ended ushering in the spring season and its bountiful fishing opportunities. 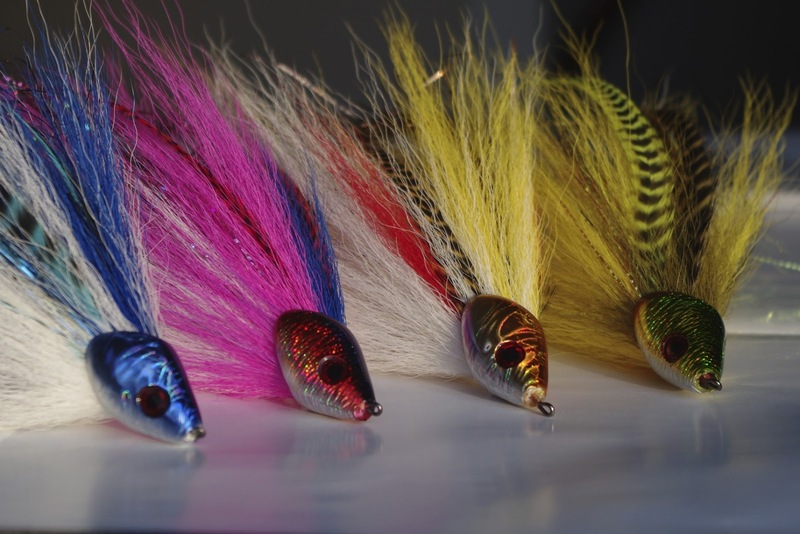 For most fly fishermen, winter is usually a time for replenishing empty fly boxes and developing a new fleet of destroyers for your upcoming season. For me, my winter featured a below average amount of fly tying, even for me. I admittedly don't tie a whole lot. My carp and trout boxes went undisturbed and the empty spaces remained unfilled. Every time I sat down to tie a fly, my mind began to wonder to a few flies hanging above me. I knew deep down I really needed to tie dozens of flies for spring stockers, dry flies for the wild trout up north, and a ton of egg/damsel patterns for carp. However, I could never bring myself to tie any of them. I often sat down and put a size 18 hook in the vice. After several minutes, and a few laughs, I'd take the microscopic hook out of the vice and replace it with a 6/0 monstrosity. Basically, all I could tie were large articulated streamers for the musky I have never even attempted to fish for, let alone catch. I went through a month long stage last year where I was convinced I was going to catch a musky. I spent a few hundred dollars on hooks, lines, fluorocarbon, pliers, jaw spreaders, a huge net, and I never went. At the most recent Fly Fishing Show in Somerset, New Jersey, I ran into Blane Chocklett and his infamous T-Bone musky fly. Needless to say, a fly caught my interest and reignited that stage from the previous year. A whole lot more money was spent, and I started trying to replicate that fly ingrained in my mind. The fever gained momentum as I realized I wasn't alone. Instagram and Facebook seemed to be full of fly tyers replicating the very same flies. I became convinced that maybe this was my year. Not only in catching a musky, but actually going musky fishing. A fly tying side effect emerged. I can only describe it through the lens of someone else's point of view. In Feeding Time, Scott Sanchez once said, "streamer patterns/saltwater flies are probably the most fun ya know? Its like you tie on a size 16 blue wing olive, you tie up the fly and throw it in your box and look at it the next time you go fishing. You tie a double bunny or a conehead the barbarian you got this little critter thats got eyes, you can talk to, you can pet it". My musky flies seemed to be beckoning me every time I walked into my room. I found myself spontaneously holding them, petting them, and grooming them. Needless to say, I developed a sickness that will only be cured by a musky in my hands with one of my flies hanging from its mouth. I think I need to catch a musky this spring. Sometimes you just have to get out there and do it. Those are some great looking flies. Being one with your flies. That's cool. Never thought of petting them. Jeez, maybe there is some kind of mojo there. Hell, can't hurt. My god those flies look so good I could slather them with tartar sauce! Nice work...and good luck! Great looking patterns...I've been saying the same to go chase the muskies this year. I have a good bite going on while they are moving into the streams next to my house... hope you have luck with them.. Awesome looking flies! Just beware, once you hook into a Muskie the addiction will be there forever. I caught my first one over ten years ago and try and make at least one trip up north to chase them. Good luck and keep us updated! Great flies! I'd love to see a step-by-step or something.